Scorched 3D is a FREE game based loosely (or actually quite heavily now) on the classic DOS game Scorched Earth “The Mother Of All Games”. 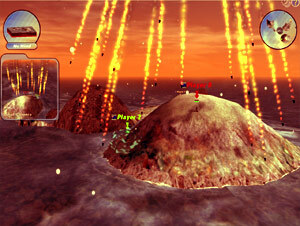 Scorched 3D adds amongst other new features a 3D island environment and LAN and internet play. Scorched 3D is totally free and is available for both Microsoft Windows and Unix (Linux, FreeBSD, Mac OS X, Solaris etc.) operating systems. At its lowest level, Scorched 3D is just an artillery game with two+ tanks taking turns to destroy opponents in an arena. Choose the angle, direction and power of each shot, launch your weapon, and try to blow up other tanks. That’s basically it. But Scorched 3D can be a lot more complex than that, if you want it to be. You can earn money from successful battles and use it to invest in additional weapons and accessories. You can play with up to twenty four other players at a time, mixing computer players with humans. There’s a variety of changing environmental conditions and terrains to be dealt with. After the end of each round (which ends when everybody dies or there’s only one person left), you get to buy stuff using the prize money you won from previous matches. my son was crazy about this game during our holidays in Cyprus. He made me and my husband crazy with constant requests to arrange him this game and to allow him to spend days and nights playing it. The villa in Cyprus we rented was really nice, we all sunbathed and swam in the pool but no one saw my son – he was in front of the computer – only shouts and screams were heard. I have even heard him using foul language with emotions from the game. Previous PostPrevious Need to Know Your IP address?